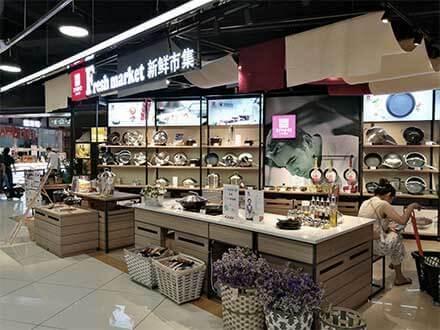 Zhejiang Sanhe Kitchenware CO., LTD was established on 18th, AUG, 2004 and seized the market opportunities of China’s manufactured exports to enter the cookware industry. In 2005, Sanhe went to Frankfurt, London, Poland, Birmingham exhibition, etc., exchanging and learning the manufacture experience of foreign cookware, winning the recognition of Israeli brand Naaman with good quality and innovative products and taking the lead in opening the Middle East market. Later, Genius, a German brand, wanted to develop a new product. The inspection standard required that the defective products of the whole batch should not exceed two. Otherwise Genius would reject to receive and they asked manufacturer to guarantee 39 days of unconditional return when the products appeared on the market. Faced with such demanding quality requirements, as a result, only Sanhe dared to take orders and successfully completed the cooperation. Good reputation brought more and more customers. Sanhe took OEM orders with almost all the well-known brands in Europe. In 2012, Sanhe was awarded as "Zhejiang export famous brand", "Zhejiang integrity enterprise" and "Ningbo major contribution enterprise". Until now, Sanhe has participated in Frankfurt exhibition every year, in Germany, the leading exhibition in the kitchen cookware industry. As an exhibitor of the European pavilion, Sanhe is on a par with many European kitchen cookware brands. Chinese food culture is extensive and profound. Sanhe has technology accumulation with many years and elegant cookware products. They serve western people's tables. So why can't Chinese people use a really good cookware? Aiming at such an ideal, Sanhe established the domestic brand and determined to integrate advanced European and American technologies with traditional Chinese cooking needs, pursuing innovation and breakthrough constantly. This ideal makes every family of China enjoy the kitchen cookware of international quality as well.